This is my all-time favorite and most used kitchen gadget. Hard to even label it a gadget because it is a very traditional item made from natural bristle. As I show you what it is, I’m not going to be able to resist the corny, sorry old joke that I never fail to make about this item. Ready? It is used TA-WASH-Y your fruits and vegetables. Hahahahahahahahahaha! 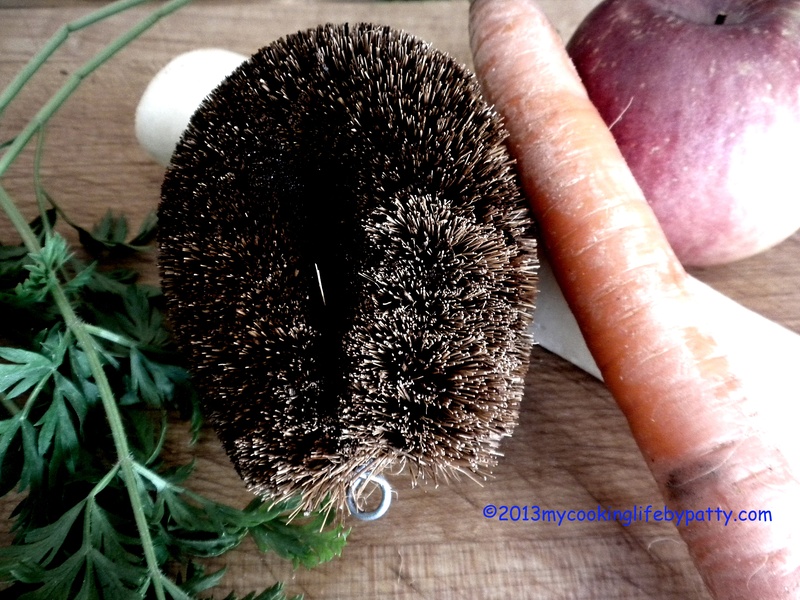 This is a truly effective scrubber that doesn’t damage your veggies! Buy it in your local Asian market or mail order. This entry was posted in Cooking, Cookware and tagged how to clean vegetables, kitchen gadget, Kitchen utensil, vegetable scrubber, what is a tawashi by mycookinglifebypatty. Bookmark the permalink. $4.95 from Gold Mine Natural Foods (mail order) but I bet you’ve got plenty of markets in Chinatown there where you can buy one.